Kelly Kline, here with 2009 Heisman winner Mark Ingram, has been photographing the ceremony and the events surrounding it since 2005. The shoot took no more than 15 minutes, the smiling 20-year-old clad in his Texas A&M jersey posing in front of a white seamless background. It’s just a series of photos in a weekend in which Kelly Kline will produce thousands of them. But Saturday, when the latest recipient of the Heisman Trophy takes a stage in the heart of Times Square, the fruits of that photo session with Johnny Manziel will be on full display — even if no one realizes it. 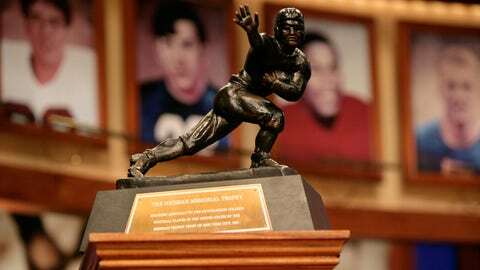 “Those are the ones that have really become part of Heisman history,” Kline said. Stretched across the background during the ceremony are the portraits of the past winners, the first 60-plus of which were painted by an a company owned by former Tommy McDonald, the Oklahoma All-America wide receiver, who finished third in the Heisman voting in 1956. McDonald, who is now retired, didn’t paint them himself — he employed a team of six artists for that — but his signature does appear on the bottom of the portraits. Tommy McDonald Enterprises produced likenesses of winners beginning with the first, Jay Berwanger (1939) through Ron Dayne in 1999. In the years that followed the Heisman Trust, with the help of ESPN for its TV coverage of the ceremony, began manipulating photos to look like the past. Kline, who was asked to take photos of the original portraits, noticed distinct differences. The Heisman Trust’s official photographer — she shot her first ceremony in 2005 — Kline suggested that to properly link the trophy’s history, she should pay homage to it by taking photos that looked like the old paintings. She studied the old renderings, looking at the shoulder angles and the different perspectives and beginning with Tim Tebow in ’07, has held a portrait session with the winner. After their Monday appearance on ABC’s ‘Good Morning America,’ the winner is in Kline’s hands. She has him don shoulder pads and his jersey and goes through a series of minute changes in the player’s stature and her camera angle to produce a photo that can link the likes of Manziel, Robert Griffin III and Mark Ingram to Doak Walker and Billy Sims. “I do different things. Like I go a little low, I go a little high. I have them turn a little left, a little right, a little straight on,” Kline said. “I usually use two different lenses, a long lens and a short lens because those two different things to accentuate your size in the camera. From Kline’s shots, Rob Whalen, the executive director of the Heisman Trophy Trust, will send a select few — generally between 2-8 — to Dan Cunningham, art director at ESPN, who is charged with building the environment for the ceremony. It’s then up to Cunningham to decide which photo will become the rendering we eventually see. What once took McDonald’s company a year to create is now accomplished in a few days. While the Heisman portraits have now gone digital, those images are even more closely related to the past than just in their look and feel. The original McDonald paintings were put in storage after the Downtown Athletic Club was forced to close its doors in 2002, its financial troubles escalating after the Sept. 11 terrorist attacks. They have since been photographed and reproduced to be used onstage, while the portraits themselves remain locked away. Like the Kline/ESPN artist creations, everything we see during the ceremony is a really a photograph. For Kline, one image creates a stress all its own: when the winner holds the Heisman Trophy for the first time — and getting it just right is everything. “That’s the most important Heisman (ceremony) moment and the one that will forever be cemented in history,” she said. Kline is the only one taking photos during the ceremony, with her images sent out to the photo services that supply Web sites and newspapers around the world. Add in the uncertainty of what the recipient will do with the trophy, and the weight of the moment is undeniable. While some winners have raised the award — only to drop it down when they realize it weighs 25 pounds, creating havoc for keeping a camera focused — Manziel, in particular, made life all too easy on Kline. Kline’s responsibilities stretch across four days, resulting in thousands of images as she follows the candidates at events from their arrival in New York City on Friday through the Monday night banquet. Along with being the only photographer in the ceremony, she’s also in the green room beforehand and has a vantage point that allows her to see a side of the proceedings that few experience. “It’s real, raw emotions,” Kline said. It was on display in 2009, when winner Mark Ingram, in the moments before they took the Best Buy Theater, walked over to Tim Tebow and admitted that he was nervous. “‘Tim was like ‘Well, let’s go over here and pray,'” Klein recounted, and the two of the went into a corner of the room and prayed together. A year later, it was Cam Newton, who dealt with his nerves in a different way — by lighting up the room. It’s the personalities that make the images and as captivating as Newton was and as genuine as Ingram came off, no winner had quiet the impact on Kline’s photography — and vice versa — than Grffin. She admits she took a risk with Griffin, the winner out of Baylor in 2011, who after receiving the trophy flashed a pair of Superman socks complete with a cape hanging off the back. Kline capitalized on it and had her assistant purchase a costume, which they cut off of, along with a pair of $10 black-rimmed sunglasses with the lenses removed. 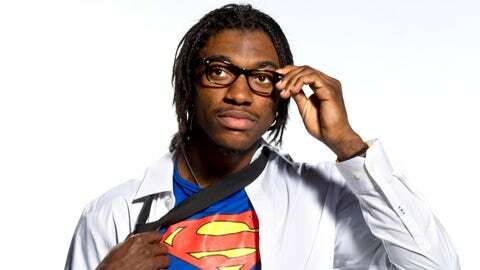 The result was a Clark Kent of a QB in transformation, the Heisman in front of him, as Griffin wore the sunglasses frames and the Superman costume under his dress shirt. But even after the shoot was over, Griffin didn’t entirely shed himself of his alter ego. “The funny thing is, these glasses … my assistant got them for $10 in Times Square. Well, he loved the glasses,” Kline said. Griffin would wear the frames to a photo shoot with university officials and VIPs and at that night’s banquet — a white tie affair — he was still wearing them. They stayed on his face throughout his speech, until Bears coach Art Briles took them off so he could wear them when he spoke to the crowd. In her own way, she has become a part of that history, and the debut of Manziel’s portrait will be the latest chapter. Kline has a place in the annals of the Heisman that is right there, right in front of the eyes of millions, yet unbeknownst to them. It’s a contribution to the trophy that is truly hidden in plain sight. Kline said of working with 2011 winner Robert Griffin III: "He was so much fun. He totally lived in the moment." 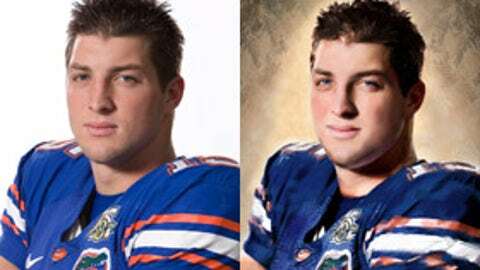 On the left is a photo Kelly Kline took of 2009 winner Tim Tebow during their portrait session; on the right is what the image looked like after it was manipulated to look like the paintings of the past. Kelly Kline has been photographing the Heisman Trophy ceremony and its surrounding events since 2005, offering a never-before-seen look at the players who have contended for the award.